1. Wash and Soak the finger millet in water for 4-5 hrs. 2. Heat jaggery in little water until the jaggery dissolves. Filter and set aside. 3. Combine soaked finger millet, water and coconut in a mixer and grind into paste. 4. Filter the finger millet paste into a large bowl. 5. Once again grind the finger millet pulp/husk by adding water and filter the paste. Repeat this for 2 times. Discard the finger millet pulp/husk. 7. Finally add cardamom powder, mix well and switch off the stove. 8. Pour into a greased plate and allow it to cool down. 9. Cut into pieces and refrigerate it. 10. 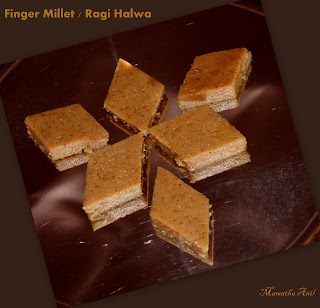 My favorite healthy finger millet halwa is ready to serve.